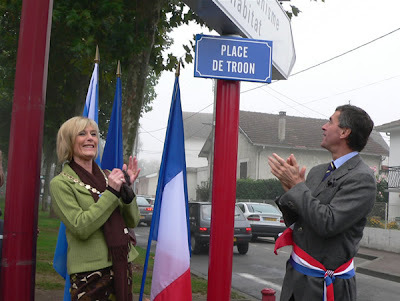 South Ayrshire Council Provost Winifred Sloan has unveiled a new street, ‘Place de Troon’ in Villeneuve Sur Lot, France, along with the Mayor of Villeneuvue Depute-Marie Jerome Cahuzac MP to mark a special anniversary. To commemorate the 20th anniversary of Troon and Villeneuvue being twin towns the Provost, members of the Troon Town Twinning Association and other invited guests took part in special celebrations in Villeneuve. As well as naming a street after Troon a special parade was arranged where local people, visitors and dignitaries walked through the town accompanied by the town band and pipers from South Ayrshire. This brought the local community and visitors together to celebrate the ties between Troon and Villeneuve. At a ceremony in the Town Hall the Provost signed the renewal of the Twinning Charter for the next 5 years. 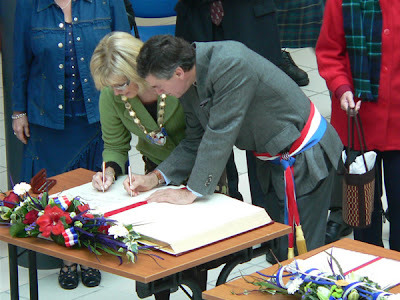 Speaking after the signing Provost Sloan said: “This was a very special event when the town of Troon and Villeneuve reaffirmed their commitment to each other as twin towns. During the last 20 years the two towns have developed an excellent relationship. There there have been regular exchange visits between the towns, schools have become involved, families swap homes for holidays, we have learned about each others culture and we share sporting interests.